Credit: Robert Mallin was a co-Creator and Designer for the UT Tower Mapping Project with five other graduate media students overseen by professors Sven Ortel. The Tower Mapping Project began as classroom project to be completed for display at the Centre for Arts and Entertainment Technology private launch party at Brazos Hall in Austin Texas. and the Grand opening of the Foundry. The Tower Mapping Project started with scaled drafting of the actual UT Tower into Vectorworks. Then deconstructed digitally for laser cutting. With the cut pieces it was assembled as a model. 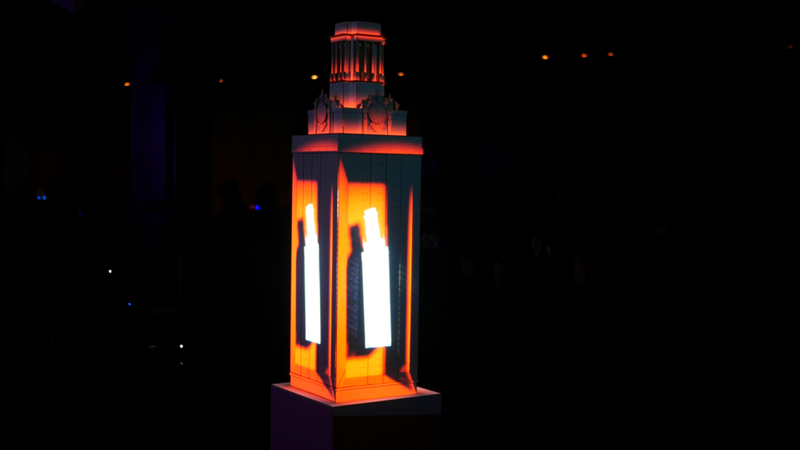 Using D3 the tower was then projection mapped and custom content created for display.